There are many reasons for wanting to send congratulations baskets to family, friends, colleagues, clients and customers. Perhaps your client in Sydney has secured a vital order, or one of your sales team in Melbourne gained one. A terrific way to show you care and are thinking about both them and their achievement is with our congratulations gift hampers. They are ideal as gift ideas for both men and women, and for most ages, and allow them to celebrate in great style. You can choose amazing gourmet food options, or terrific wine and nibbles collections. Perhaps French Champagne would hit the mark, or the refreshing non-alcoholic Sparkling Cabernet from Maggie Beer. Let the celebrations begin with that surprise Congratulations Hamper delivered direct to them from Australian Gourmet Gifts. Show them how proud you feel, don’t just like it on Facebook! Congratulations gifts delivered to their door at this special time. Don’t just ‘like it on Facebook’ – show them how very proud and excited you are about their big news! If you can’t be there to pop the champagne, celebrate your loved one’s special achievements with a congratulations gift hamper delivered straight from your heart to their door. A ‘love’ of the most delicious kind, congratulations gift baskets are the ultimate way to celebrate the magic milestone of someone special. In an age when real sentiment has been replaced with a Facebook like, be the one to show them real love with gorgeous gourmet congratulations gifts delivered to their door. You’ve been with them the entire way. You’ve shared the highs, lows, late nights, and blood, sweat and tears. You’ve been their biggest cheerleader and now it’s time to recognise their hard work and dedication. Graduating from university, winning a new job, smashing targets, or passing an exam – whatever the reason, celebrate your shining star with a congratulations gift sure to show them how proud you are. Kick off the celebrations with a basket filled with handpicked products of the highest quality, beautifully packaged and affordable. Add a special touch with a personal message to congratulate them on a job well done. Here’s cheers to new beginnings – a new baby, home, job, marriage or business deal. A congratulations gift is the perfect way to celebrate a new chapter in your client’s or staff member’s life. Show them how thrilled you are with a gift to remember. Congratulations baskets are filled with decadent chocolates and nougat, gourmet jam, mustard and pesto – not to mention an aromatic red or sparkling white wine. They are the ultimate corporate hampers to toast a positive change in their life! 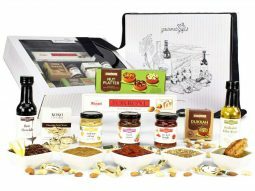 Start browsing Australian Gourmet Gifts for congratulations gifts delivered straight from the heart to their door. Beautifully packaged with premium goods, congratulations gift baskets are the best way to celebrate and remember life’s special moments. Need a congratulations hamper in a hurry? No problem. 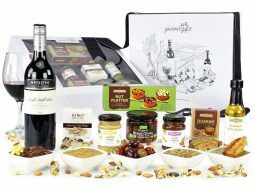 Australian Gourmet Gifts makes choosing the perfect congratulatory gift a breeze, and we deliver free to all of Australia.